Where do tears come from and why do we cry? Where do tears come from? Tears are made by little glands above our eyes, called tear glands, or lacrimal glands. There is one gland above each eye; each produce tears that travel to the eye through tiny pipes, called ducts. There are a number of these tear (lacrimal) ducts behind our upper eye lids. Our tear ducts are constantly producing tears, to keep our eyes clean and moist, but we don’t usually even notice. When we blink we wipe the tear fluid over our eyes, keeping them moist. This fluid is then drained off from the eyes through more ducts. It is only when we start producing a lot more tears that we start to notice them. The ducts that drain the fluid away cannot cope with all the extra tears and they start to run down our cheeks. Tears are basically made of slightly salty water. They also contain enzymes that kill bacteria and vitamins and minerals. Some tears contain proteins, called hormones, that can change how we feel. Scientists are still working this one out. We do know that we cry different kinds of tears in response to different things. Science defines crying as the process of producing tears in response to an emotion – be it sadness, fear, anger or happiness. When we produce tears to clear something out of our eye or to moisten the eye… Then we call this lacrimation. So how does it all work? Well, the emotional crying seems to be triggered as a response to activity in a part of the brain called the hypothalamus. This part of the brain responds to our different emotions and can produce chemicals, called neurotransmitter, that will travel to specific parts of the body and induce a response. In the case of crying, the neurotransmitter produced is called acetylcholine and it triggers tear production in the lacrimal gland. The reason why our brain responds in this way to emotions can vary. Babies, for example, cry to communicate with us… Telling us the are tired, hungry or in pain. This makes sense as they do not have many other forms of communication available to them. But why do we still cry here we are all grown up? It may be that crying creates other responses in our bodies, our heart rate changes, our breathing alters and other chemicals are released into the body. Crying can make us feel better. Crying also allows us to show people how we feel! We may have evolved our crying mechanism to let people know what we are feeling, or to get sympathy or support. Sometimes we cry when we see others hurt or sad and this created empathy, something that allows us build strong bonds and create supportive communities. What different types of tears are there? Reflex tears – we produce these in response to something else, usually something that is irritating our eye… From a small piece of dirt to a strong chemical, such as the vapour off a cut onion. Emotional tears – these are the ones that get switched on by our emotions, even if we try to suppress them! These tears make us human! I am very excited to share this latest project with you; this is an idea I have had for a while so I am delighted to have finally finished and published. I really hope you like it and that your junior scientists get plenty of entertainment from this Pancake Science Magazine. Have a look through and see what you think, there are experiment ideas and a video link to show you how. It is crammed full of interesting facts… from who made the first pancake to the mathematical formula for the perfect pancake flip. You’ll also find puzzles and quizzes and a free printable download if you prefer to print them off and let the children test their pancake knowledge. There are also some pancake jokes to entertain you all and Dr. Simple can be found throughout the magazine, a familiar face with a few costume changes! There is a little colour coding for all the subjects covered, from chemistry to astronomy, to maths. So your kids can just dip in and choose their favourites, if they prefer. I would really love to hear what you think and how your children find this magazine, if you have a minute to give me any feedback I’d be delighted. I haven’t shown this to my own kids yet, but I think I have this rainy afternoon’s entertainment sorted now. Need a mobile friendly version? just click here! And this is a separate link to the free printable. I am just back from a week in Malta. I was attending the annual Science Expo and I was really impressed with how well it was organised and the level of enthusiasm and knowledge among the children. From primary school level, right up to third level, students came up with some great ideas, prepared, tested, recorded and then presented their projects with confidence. 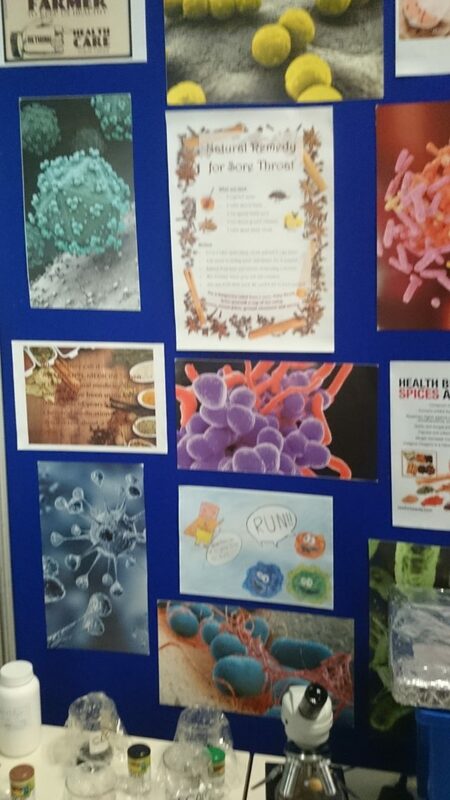 The ideas presented varied widely from what conditions help us on memory tasks to investigating the use of apples to combat dust mite allergies (a subject close to my own heart). The place was abuzz with invention, innovation and imagination. This project investigated the best herb or spice to combat a sore throat. You can check out the winning projects on the NSTF facebook page. One project looked at the effects of smoking on a number of levels. The team involved went as far as to set up a Facebook page to emphasis their research, a really great idea, you’ll find it here. There were also a number of workshops running for the week. 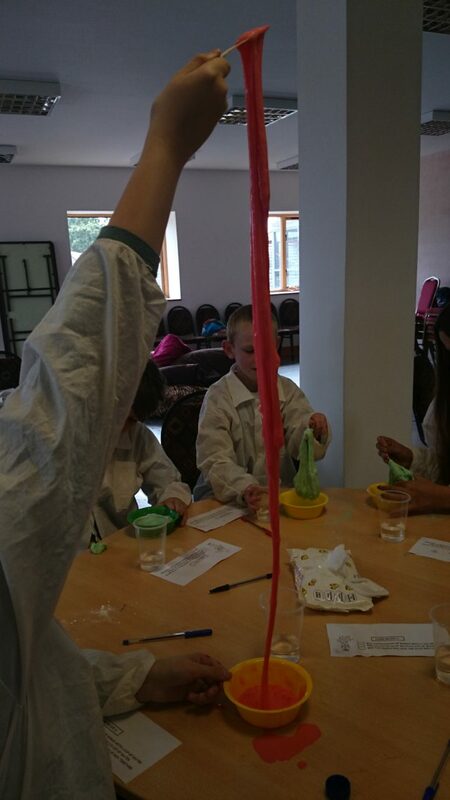 I ran an interactive one on acids and bases, a workshop created to show children how easy it can be to do science experiments with things you may have in your own kitchen… because science is an anywhere kind of thing. I was lucky to have my daughter with me for the week, she was a great help and even got to demonstrate the first experiment to the class. This Inflating balloon experiment is a really simple one but I love the squeals of excitement when the balloon starts to grow, even when the children have anticipated what is to come. One class to visit my workshop was from the International School in Malta. I was charmed when at the end of the workshop, each child thanked me in their own language. There was 16 kids in total, and I received a thank you in 14 languages! There were many other great workshops throughout the week, I was just disappointed that I could not sneak in and have a look at them all. 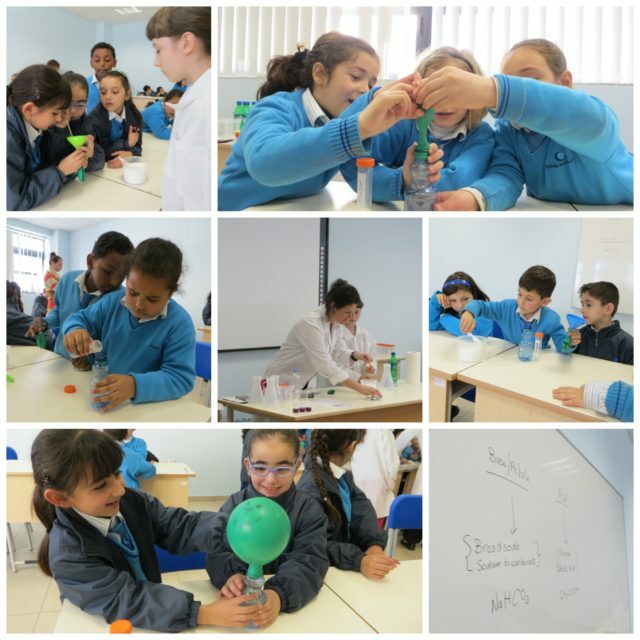 On a national level there was the forensics division of the Maltese police force, explaining to children some of the techniques they use as well as allowing children try some forensic experiments themselves. There was also a very informative shark exhibition run by the shark research centre on the island. My daughter attended their workshop and came back with lots of great facts to share with me. There was also plenty of international outreach programs represented at the Expo. Iris Nijman of Universe Aware ran a workshop informing children about the conditions on the planets in our solar system, then the children got to create their own alien that was adapted to life on one of the planets they had learned about. This was a great way to make the workshop interactive for the children and a unique way to make the information much more memorable. Jeppe Petersen brought an interactive workshop on light to the Expo, funded by the Danish Youth Association of Sciences (UNF) at and the International Movement for Leisure Activities in Science and Technology (MILSET). 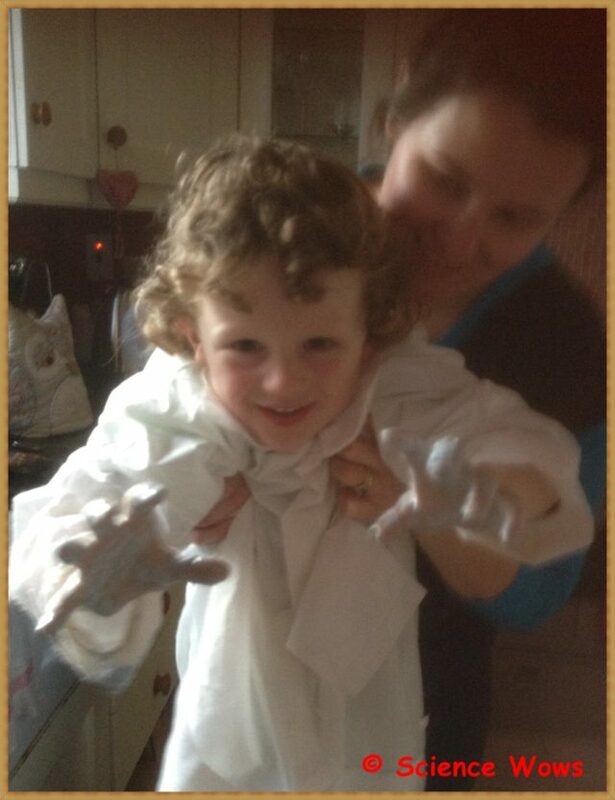 This workshop was hands on and tailored to each age group and each learning level. In João Retrê’s workshop children got to make their own planets from the solar system and then place them in their correct location on a scaled model. A great way to get a grasp of the perspective of each planet and its size and distance from its neighbouring planet. This workshop was part of the Portuguese Institute of Astrophysics and Space Sciences outreach program. Mel Evans, from Cheltenham University, posed some very interesting questions as part of her PhD studies… how accurately is science portrayed in films and what is our interpretation of it? Does the film industry have a moral obligation to depict science with accuracy or is it acceptable to go well beyond the realms of possibility? Do we think that what we see in a film is possible in reality? Mel posed all these questions as she shared and discusses a number of popular film clips and received some very interesting responses from the children and their teachers. Simon Guilliams from Belgium presented his self-built tri-copter at the Expo. 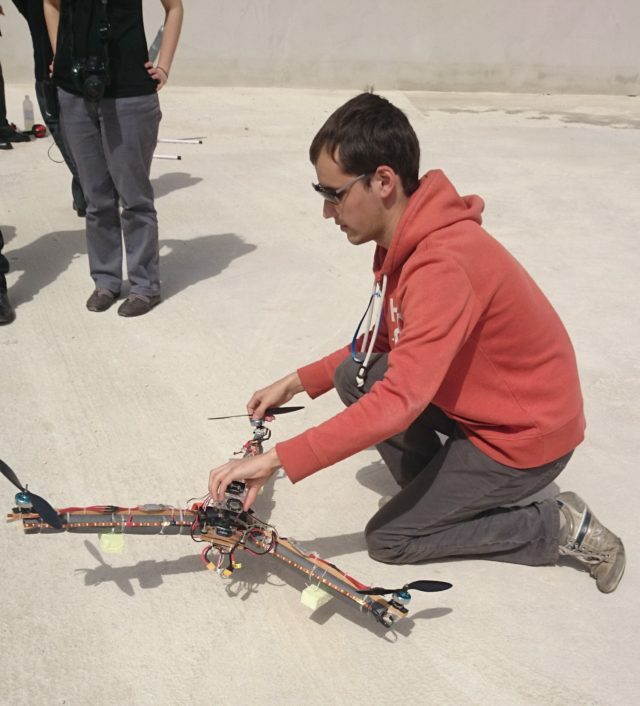 Simon was a winner at the Belgian Science Expo with the tri copter he built in his back yard, starting at the age of 14 and building and improving it over the last four years. His prize was a trip to the Maltese Expo and a chance for him to share his creation. Of course our week in Malta was not all about science, we also got to see some of the island. 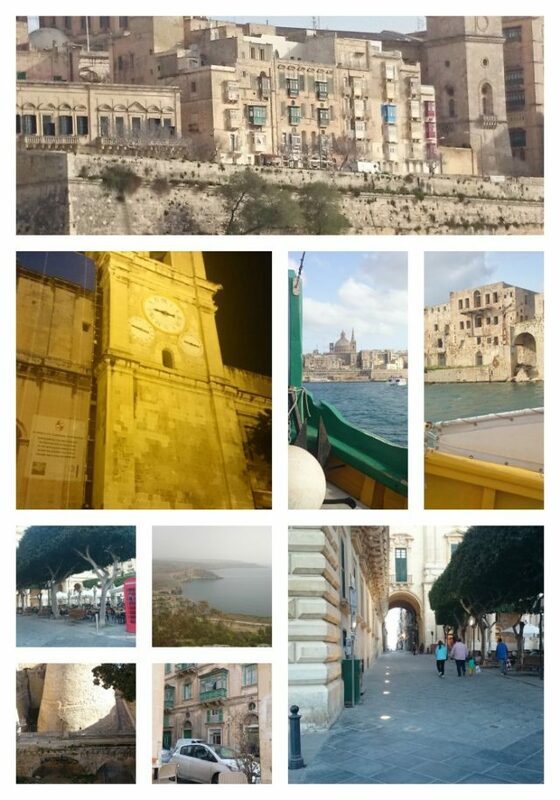 We were a mere 15 minute bus drive from the beautiful capital, Valetta. We viewed this first by night, on a very informative walking tour of the city (organised by the NSTF). It was lovely to return again and see the same sites by day, soaking up the atmosphere as well as the Sun’s rays. There were many other activities organised for us by the NSTF, including a country walk at the North end of the island and harbour boat trip. I know I haven’t been blogging much lately, I am trying to work on a little something else that I have wanted to do for a very long time. If I ever get the other project finished I’ll be sharing it right here so watch this space (not literally, it’s taking me a LONG time!). There is still plenty of science going on in the background though, as is common enough around here. This week we repeated an old favourite, an experiment demonstrating water flow and transpiration in plants… our coloured flower science experiment. I spotted a bunch of pretty white tulips in my local super market and that was all the reason I needed. I had also spotted a set of little bottles while away in Westport last weekend and had to buy them for this experiment, which, I think, elevates my geek status to a whole new level. I have blogged about this topic before, so if you want more information you can check out this post. *This will work with all (or almost all) white flowers but it works better with some than others. You can of course use other coloured flowers, daffodils are a popular choice. I have achieved good results with roses, carnations, oxeye daisies and some Chrysanthemums. 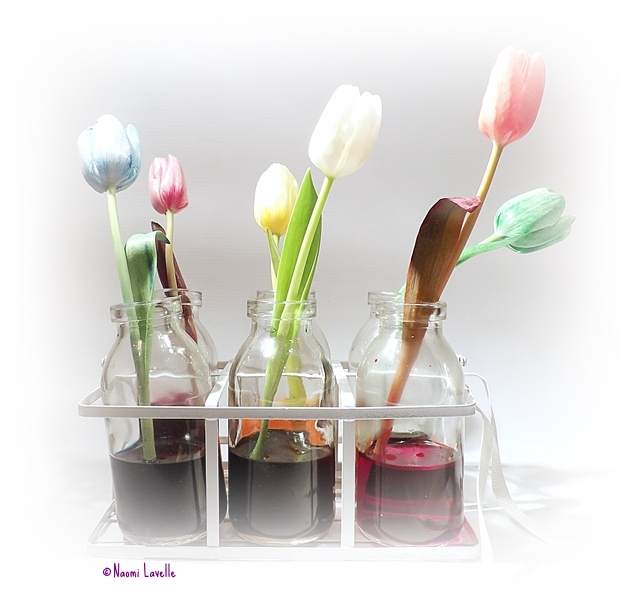 You can choose the flowers based on what you want to achieve but if working with children (particularly young children) or doing this as a classroom project them I would definitely recommend the tulips. The results are rapid so children will be able to see the colour arriving into the flowers within a fairly short time frame. Choose how many different colours you want to use. Place one colour into each glass and add water. I usually use at least 10 mls of food colouring to 20 mls of water (if unsure use a 50:50 ration of food colouring to water). 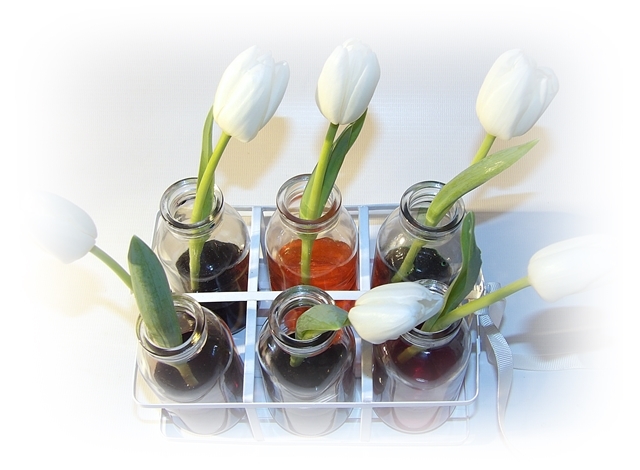 Choose your flowers, one for each glass, and trim them to the desired length. You will get a more rapid result with a shorter stem. Water is transported up the stem of the flower through little tubes called xylem. The coloured water will travel through the xylem all the way up the stem to various parts of the plant and right up to the flower. The coloured water stains the plant as it moves through it and this is most apparent when the white flowers change colour. The water ultimately evaporates out of the plant through little pores called stromata. This process is called transpiration and is much like perspiration in humans. If you want to take this one step further you can try to make a multicoloured flower, like I did with this rose last year. Just click on the image to go to the post with full instructions. If you try this experiment, or a version of it, I would love to hear how it you get on! Science Week 2014 kicks off! And we’re off! Science week 2014 officially kicks off today. Dr. How’s household has been busy preping for two weeks of school science fun, bringing The Science of Sound into 15 schools. 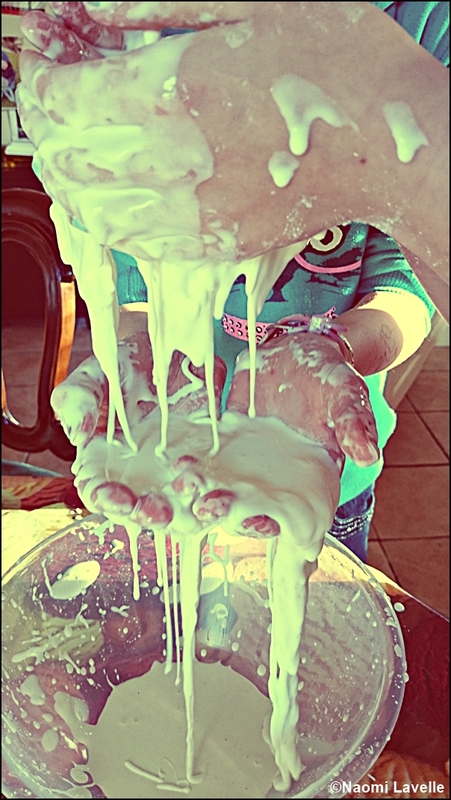 I had a house full of kids today, all happy to help me put the finishing touches to things 😉 The children made a bowl of oobleck and I showed them the effect of sound on this non Newtonian fluid. I love the reaction from children and teachers when we do this experiment in school and I will share it with you later in the week. 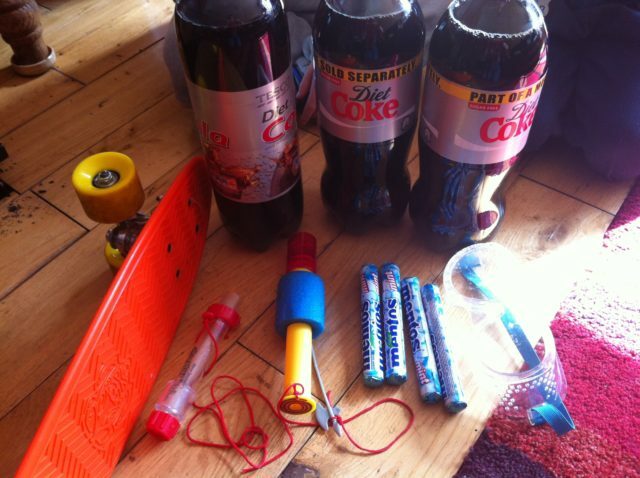 The workshops will include buzzing balloons, singing pipes and a whole lot of making noise! If I am not coming to your school you can still catch the workshop at the NUIG Science and Technology Festival Exhibition on Sunday 23rd November. If you want to find out what is on in your area check out the Science Week Ireland website, or for details on the Galway Science and Technology Festival line up, just click here. You can keep up with it all by following the hastag #Sciweek2014. Where ever you are and whatever you are doing I hope you get to join in and get hands on with some science.